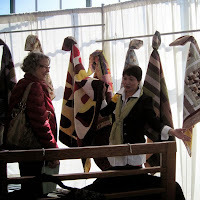 The Voices in Cloth Guild Marketplace is a wonderful opportunity to sell your quilts, wall hangings, wearables, and fiber arts such as scarves, purses, and table runners, for a price that you set. Items need not have been made since the last quilt show, but should be new and in excellent condition. You set the sale price for your item, but there is a minimum sale price of $30.00. EBHQ will retain 25% commission on each item, or, if you wish, you may donate the full proceeds to the guild. EBHQ will also collect tax on the selling price and forward it to the state. Participants will need to volunteer at least two hours to help with the Guild Marketplace. This is in addition to any other VIC volunteer commitment. 1. Entrants must be members of EBHQ. If you would like to join the guild, click here. 2. Six (6) items may be entered. We will let you know if more space is available. 3. The maximum size of a quilt that can be hung is 60" x 60". Larger quilts will be folded. 4. Quilts with sleeves along the top edge may be hung for display, depending on space. Art quilts must have sleeves. 5. All items must have a label with your name and the name of the item. Quilts/wall hangings should have a label on the back, in the bottom left corner. 6. Entrants must check off the box on the online entry form for the Insurance Waiver and Assumption of Loss form shown in detail on the entry form. When payment for your item is received from the buyer, the item will change hands. If checks are submitted for payment they will be made out to EBHQ. The Marketplace committee will notify you of all sales a few days after the show. You will receive a check and an accounting of each item sold. It will detail your price for the item, sales tax collected, and your EBHQ donation. March 10: Deliver items to Cindi Cossen's home, 5624 Huntington Ave., Richmond between 10 am and 4 pm. Questions? Contact Paula Zurowski, 510-235-1713 (paulaz@sonic.net), or Jean Wolslegel, 510-521-7105.